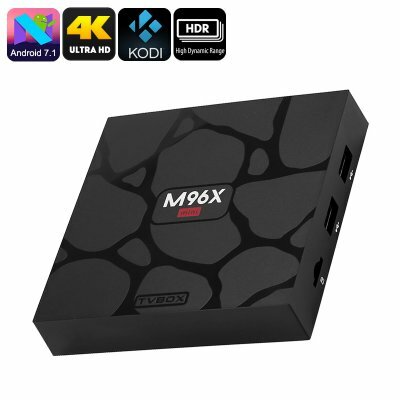 Successfully Added Android TV Box M96X - Amlogis S905W CPU, 2GB RAM, Android 6.0, Dual Band Wi-Fi, Kodi, H.265 Decoding, 4K, SPDIF to your Shopping Cart. The M96X TV box has a sophisticated compact design so it won't take up much space on your desk or in the home. This powerful little TV box has the Amlogic S905W CPU clocked at 1.5GHz and 2GB of RAM that offers fast processing for multitasking. With 4K support, you can bring your content to life on supported TVs for a pin sharp and crisp viewing experience. The TV box supports H.265 video decoding. This allows faster decoding of compressed files so you can stream and watch content seamlessly. Take advantage of the SPDIF port to add awesome audio to this TV box and enjoy a home cinematic experience that's as rich on audio as it is on visuals. There are plenty of other ports so you can connect a USB mouse and keyboard turning this tv box into a min computer. Alternatively, add a game controller and go all out for gameplay making the most of the 3D graphics accelerator. Dual band wi-fi and Gigabit Ethernet are both available on this TV box so you can enjoy fast stable data speeds whether your running wirelessly or with a network lead. You'll also be able to stream content directly from the preinstalled Kodi 17.3 media player or vias a host of other apps from the Google play store. The M96X TV box comes with 12 months warranty, brought to you by the leader in electronic devices as well as wholesale TV boxes and media players.